Update: Police arrested a woman's son in connection with her killing. Read more here. 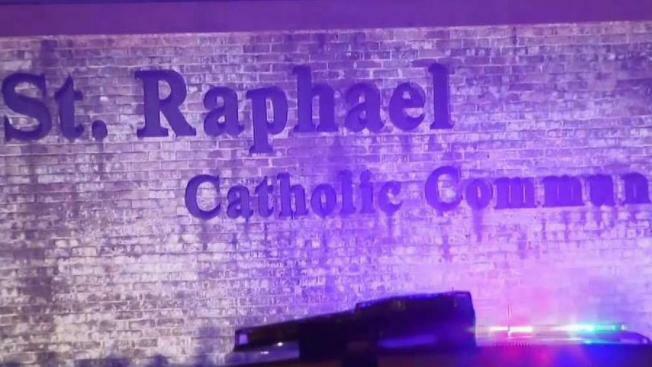 Officers arrested a suspect the morning after a woman was stabbed to death outside a Catholic church in Rockville, Maryland, Friday evening, police say. Montgomery County police said officers responded to a call about an unconscious woman at Saint Raphael Church on Dunster Road about 6 p.m. When they arrived, they found a woman by the flagpole at the entrance to the church. She was bleeding and unresponsive, police said. Medics arrived and rendered aid to the woman, but all efforts to save her life failed. Police announced they arrested a suspect Saturday morning. They haven't identified the person arrested or released a motive. "It occurred at a very public place at a busy time in the evening so, it’s, it's very concerning," said Rick Goodale, spokesperson for Montgomery County police. Homicide detectives roped off the entrance to the church and looked for surveillance cameras inside and outside the church. Police searched and took photos of a car at nearby Falls Road Local Park. A source close to the investigation told News4 police were trying to find out if the car belonged to a suspect. Goodall said residents in the area should call police if they see anyone or anything suspicious. In a statement to News4, the Archdiocese of Washington said the woman's death did not appear to be connected to the church. "At this time, we have little information on what happened, but the incident does not appear to be related to the parish or school. The parish staff who were on site this evening have been speaking with the police and they are cooperating with the police investigation. We extend our heartfelt prayers to the individual’s family," the archdiocese said. No further information about the killing was immediately available. The church is across from Ritchie Park Elementary School and next door to an assisted living facility. Stay with News4 and NBCWashington.com for updates to this developing story.